Today my friend Donna was returning after a busy month of traveling abroad and I thought that she might appreciate a fresh apple pie to welcome her home. 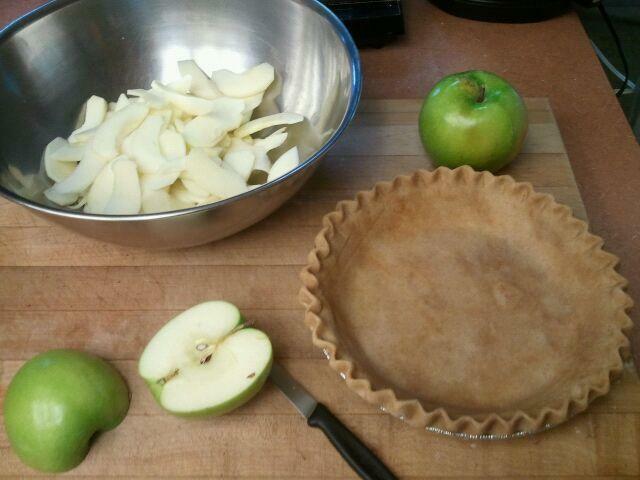 I started out the day by rolling out my crust and then peeling the apples for the filling. One of the recipes that I found while I was researching for this blog was named after someone’s grandma. 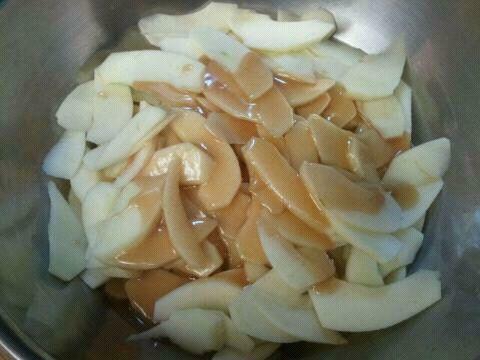 Seems this grandma cooked up a syrup instead of mixing the apples with sugar, flour and cinnamon, and then poured it over the apples in the pie crust. So today I made a syrup with butter, flour, sugar, cinnamon and apple juice and tossed it with the sliced apples and then arranged them in the crust. Oh, and I also tossed in a cup or so of sliced almonds. The pie took about an hour and fifteen minutes to bake but when it came out of the oven, it really looked delicious. 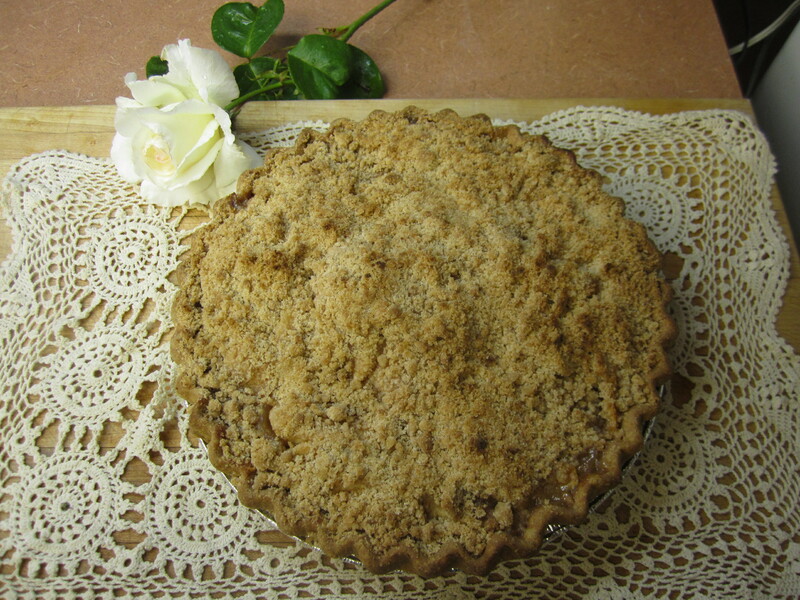 The apples and the almonds were lightly browned and the crust was practically perfect! 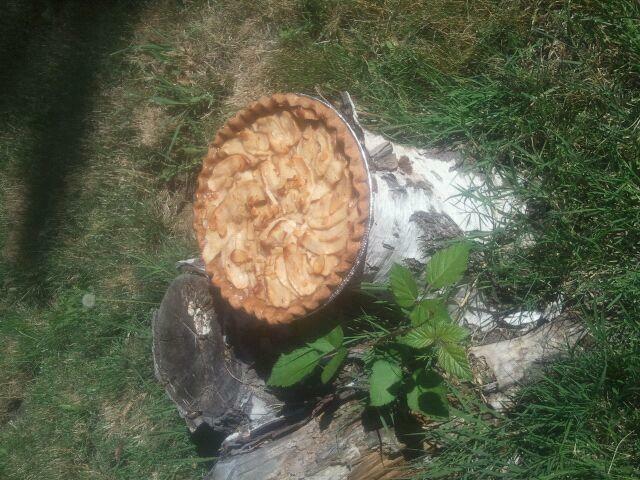 I was anxious to deliver this pie for I was very pleased with how it had turned out. Early this evening I went to Donna’s house and brought her the pie. She was delighted to receive it and asked if I was doing a fundraiser. I told her that this “project” was more along the lines of a gratitude journal with food and I left her to settle in. I hope that Donna is able to get some rest and am very grateful for her presence in the world. Friends like her are really great to have around! If you’ve lived in Ashland a while, you probably knew Joanie. When I came to Ashland in the fall of 1986, I began hearing about her from her friends and co-workers at a restaurant called Geppetto’s. Joanie had painted a mural and her artwork was on the menu and the awning. It was easy to sense her presence even though she was not around. And it was hard not to be impressed and a bit in awe of her. 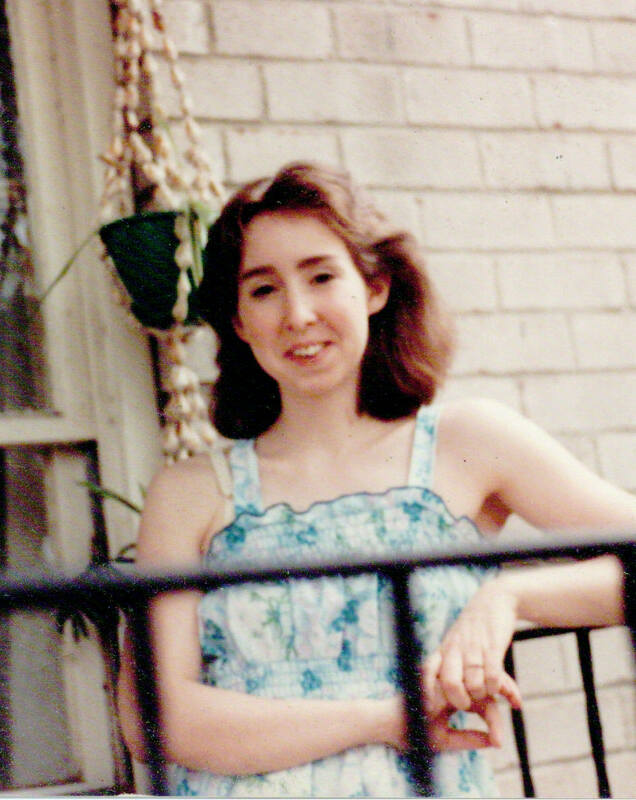 Joanie and I didn’t share a lot of history – I arrived in Ashland after she had moved away and was amazed at the wake that she had left behind. When I finally did meet Joanie, I was a little bit intimidated, but I loved how she was not afraid to speak her mind. That is not something I was encouraged to do. The biggest bond Joanie and I shared was my daughter, Alexandra. They shared a kindred spirit and a fearlessness that I cannot fathom. 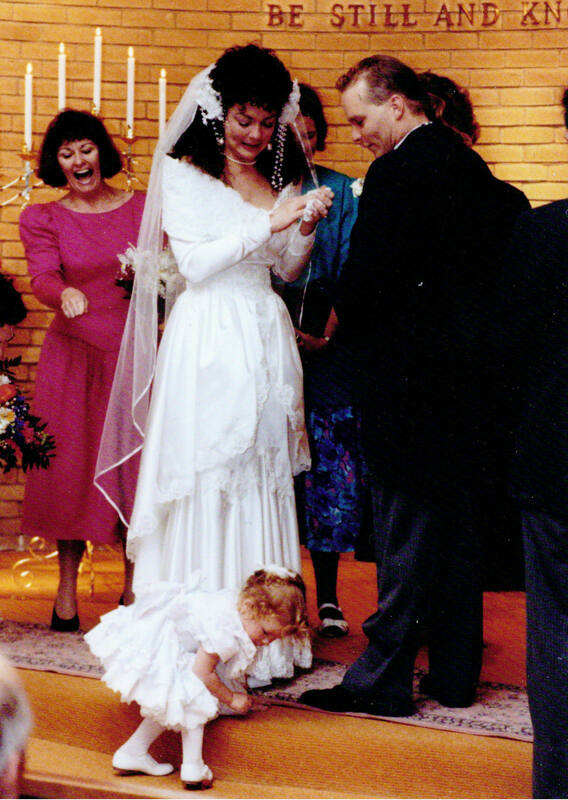 When we attended Joanie’s wedding in Seattle, my daughter (who was 2 1/2 at the time) was restless in the pew and fought to be set down. I gave in and put her down and turned my back for a moment and when I looked again, she was gone from my sight. I didn’t know what to do or where to look for her and then I heard laughter. My daughter had left me and gone up to the alter where Joanie and Tucker were, and she was picking up rose petals, oblivious to the audience that was there. 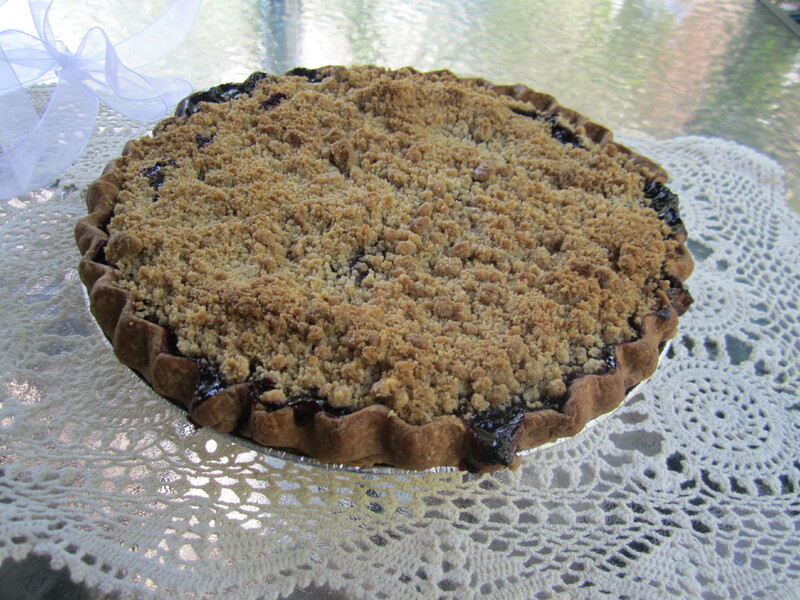 Today is Joanie’s birthday and this morning I brought an apple crumb crust pie to the Jefferson Public Radio studio at Southern Oregon University to honor her memory. May she forever live on in our hearts. Today is my friend Karen’s birthday. I’ve always remembered the date because it is one day before my sister Nancy’s birthday. Karen and I met many years ago when our daughters were in first grade at Helman Elementary. Karen was the first person, who was not our neighbor, who invited our family over to dinner. And while I don’t recall what it was exactly that drew our girls together, I know that they both were redheads and they liked to play dress-up. Sometimes that’s all it takes. Karen grew up here in Ashland, while I was a transplant from New York. She has been a go-to person when I wanted to know the story behind the story. 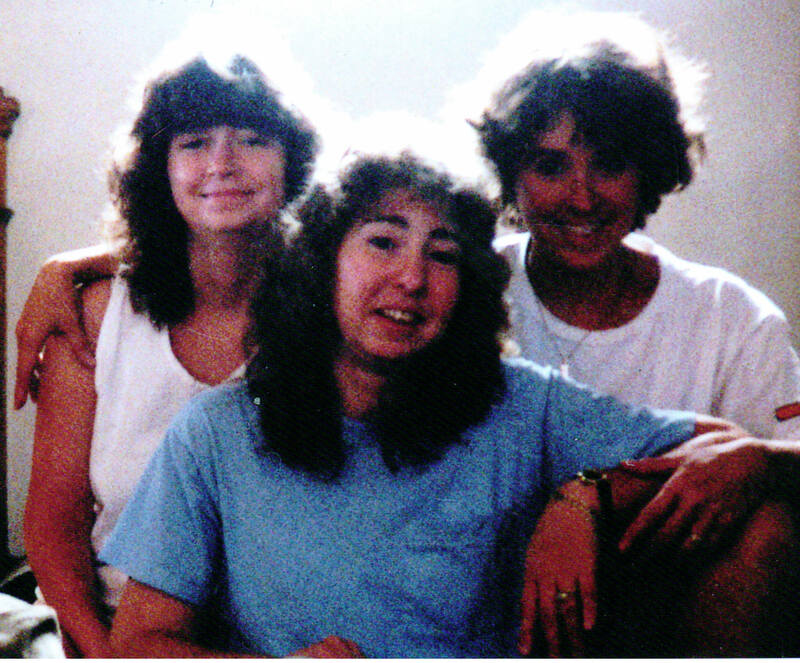 Karen and I have had some shared history: our daughters were our first bond, but we also worked together for a number of years and I have gotten to know many of her relatives quite well. It’s nice to feel so connected to a long time Ashland family. 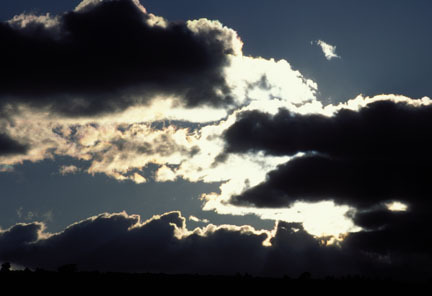 I think that this is a really great way to look at this situation and I like that Karen can see the silver lining in otherwise grey clouds. Thanks for being a good example, Karen. Happy Birthday! This morning I was invited to a brunch put on by my friends Mark and Leslie. There was a wonderful assortment of friends and foods and we settled in for a nice visit. A short time later, our friend Katrina arrived. It had been a while since we’d spoken and so we sat together and chatted for a while. Katrina told me that she had learned some things recently that had helped her. Then she mentioned spending time with her neighbor Bob earlier today and how much his words had meant to her. I know what she means; it’s really nice when a friend helps you just by being there with you and listening to your story. Sometimes we need someone to point out things to us that are so obvious to everyone else but that we seem unable to see. Immediately I wanted to make a pie for Bob for sharing his wisdom and compassion with Katrina, who then shared hers with me. I asked her if that would be possible and she thought it was and we made arrangements for me to deliver the pie later in the afternoon. When I arrived at Katrina’s house we discovered that Bob had gone out for a while. She called him (having just been given his cell number!) and told him that there was a surprise waiting at home for him. No, I did not – but I love that Bob’s age and my pie gift to him had the same number. 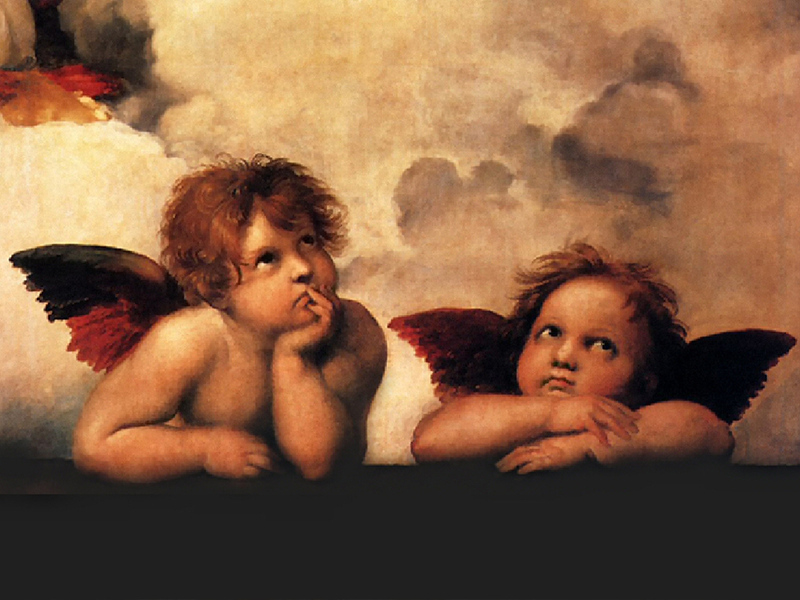 It’s the little coincidences like that that keep me thinking that this project is divinely inspired – and I am so very glad to be on this journey. When I first visited Ashland in the early eighties, one of the first people that I was introduced to was Jay. Jay worked at a local restaurant and was kind of a celebrity. He was living in a small “house” affectionately referred to as the “love shack.” Jay knew all that was going on around town and knew where the people in the know were. I guess you could say that he was plugged into this community. Jay seemed to know everyone and has friends in many places. I heard a story that when Meryl Streep was in the Rogue Valley filming “The River Wild” a friend of Jay’s spoke about him to Ms. Streep. Not long after, Ms. Streep stopped by the restaurant where Jay was working just to say hello. The guy has a certain je ne sais quoi about him! For a while, I worked alongside Jay. He was a waiter and I worked in the kitchen making special desserts. One special memory that we share was when we delivered food to the Britt Festival for a special show that benefitted a local not for profit organization. I was asked to make a birthday cake for Jackson Browne which was in itself an honor. Then Jay and I were given backstage passes and were privileged to serve dinner to Bonnie Raitt, Jackson Brown and John Trudell. It was truly an amazing night. It’s been a busy week and somehow I did not find out it was Jay’s birthday until a few days after the fact. 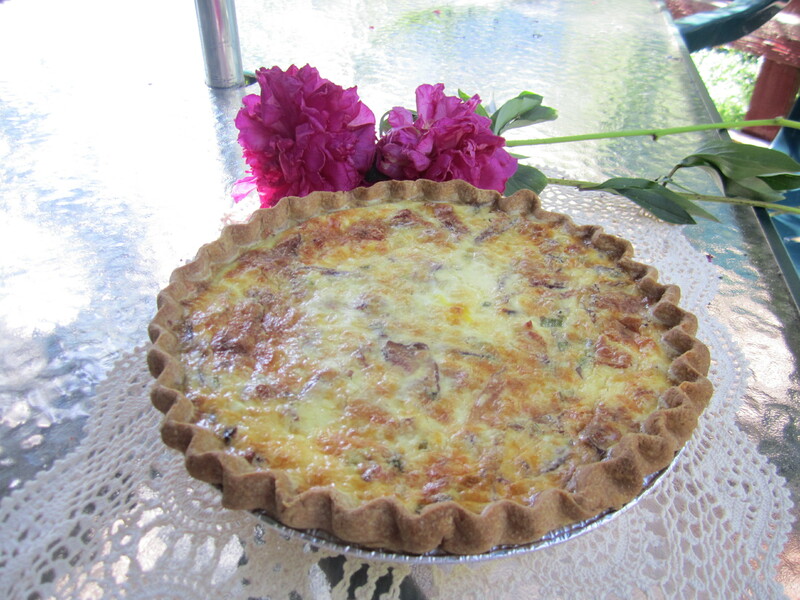 Today, I made Jay a Quiche Lorraine and brought it to him. He’s been my friend for 25 years and we have shared a lot in that time. I want to thank him for his friendship, wish him a very Happy Birthday, and hope that he has many happy years to come. Tonight we expected guests for dinner. They included Bob Mutchler, his wife Suz, daughers Annie and Claire and brother Dwight and sister Cheryl. Somehow, we had a few more guests than anticipated, but we still had enough food to go around. We’ve known Bob and Suz for more than twenty four years and I met Bob’s twin sister Sheryl at his wedding. Sheryl was 8 months pregnant at the time but weighed under 100 lbs. She was as we east coasters affectionately referred to thin people, “a skinny melink.” I weighed more than Sheryl and I was not even a little bit pregnant! Bob’s family and ours have been part of a group of friends that have had an annual camping weekend for more than 15 years. Sheryl has only come to our camping weekend once but she was so gracious and sweet that it was easy to want her back in our midst. She is an incredible cook and pretty funny besides. Tonight when all our guests had gathered, I was able to present Sheryl with a Strawberry Rhubarb Pie. She has been like a sister-in-law though I did not marry her brother. She has welcomed us into her home and and listened to our stories without looking bored. To Sheryl, I offer my sincerest thanks for welcoming us into the Mutchler fold. We feel so comfortable in her company and are very grateful for her friendship.